0.1 Find the best outdoor toys for toddlers. From the best outdoor playsets to water toys for toddlers, we have found outdoor toys kids will love. Find the best outdoor toys for toddlers. From the best outdoor playsets to water toys for toddlers, we have found outdoor toys kids will love. Worried your toddler spends too much time on technology with screen time and inside the house? Don’t worry, most Mom’s feel the same. Sometimes and it can be so easy to stay indoors with our busy modern family lifestyles. Getting out in the fresh air and in nature is so important for everyone of all ages. Teaching your toddler from a young age to enjoy the beautiful outdoors is such a wonderful life skill to give your child. To help you make outdoor time fun and engaging, Meraki Mother has created the ultimate list of best backyard toys for toddlers. These are a selection of the best outdoor toys for kids which are sure to get every toddler outside and having fun. From the perfect outdoor toys for 1-year-old to water fun! Our list of best outdoor children toys includes everything you need to make outside play for toddlers fun and interactive while helping to develop gross motor skills. Amongst the best outside toys for toddlers are playsets. They are so many options to make sure you include all the fun that your preschooler loves. From slides to climbing, be sure to get a playset that includes your toddler’s favorite activities. 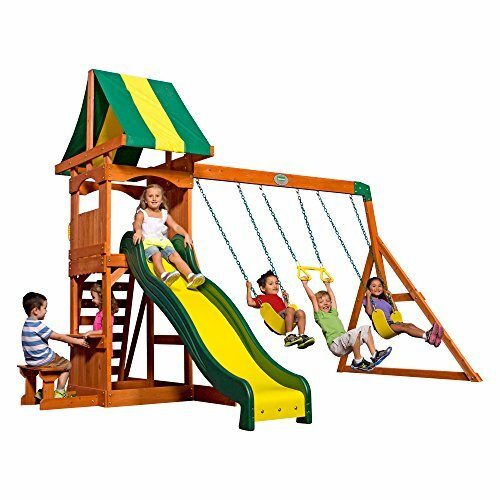 Here is our list of the best outdoor playsets. Perfect for children aged 2-years-old all the way to 6. Made from hard wearing materials, perfect for backyard toys for kids. Has two slides, a ladder and a climbing wall. All great activities for preschoolers gross motor skills. Has a turning steering wheel for even more fun. Both the ladder and the climbing wall have handholds to encourage independence and safety. 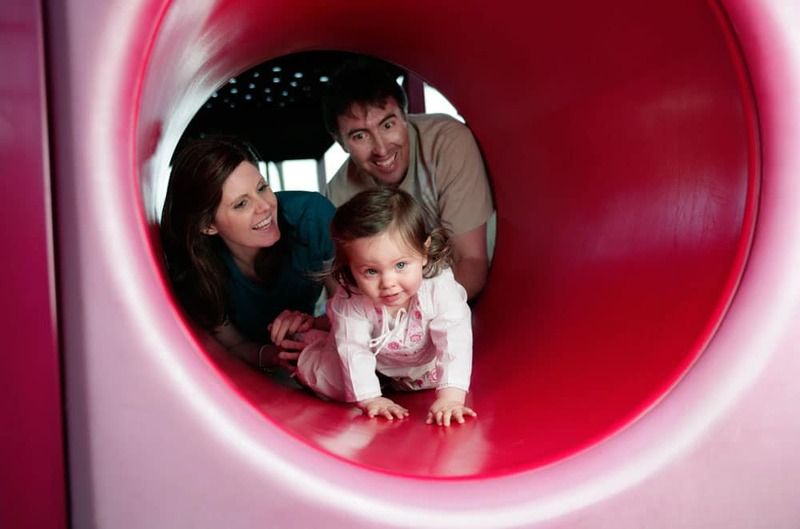 The fun climbing stairs, slide and crawl-thru are the best activities to enhance your toddlers gross motor skills. 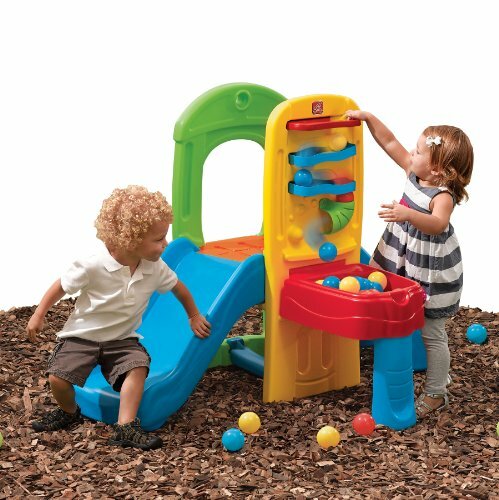 The 10 fun play balls included, add a great sensory activity for toddlers as they drop them through the playset maze. 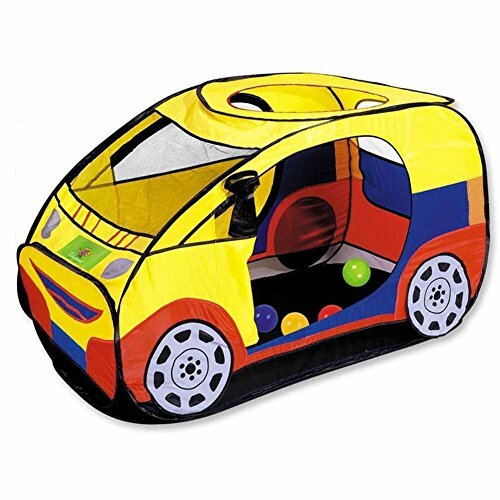 All preschoolers love to play hide and seek, and this cool playlet has the perfect hiding spot. 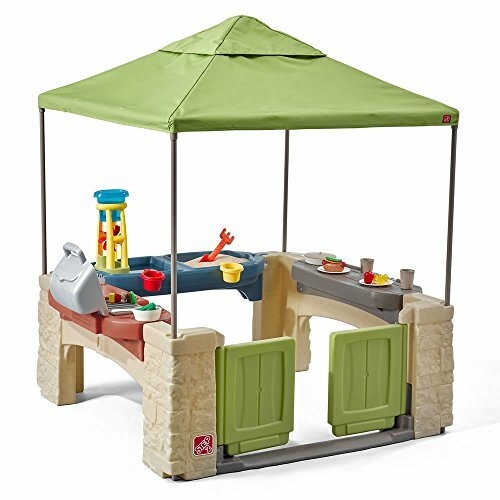 With an added canopy, this toddler playset is perfect for protecting delicate skin against the sun. Includes a sand and water play area for lots of preschooler sensory fun. There is also a lid, so after playtime, the activity table is protected from animals and pests. Kids kitchen, sink and grill area for lots of imaginary play. Includes swivel faucet and clicking grill knobs for the ultimate kid role play area. 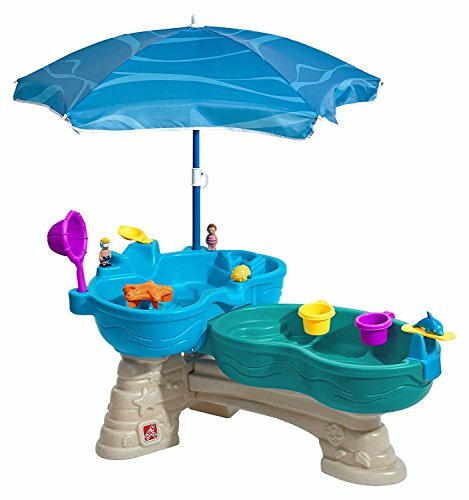 Includes accessories for the water play area and dish set for the cooking area. Snack table for your toddler to enjoy the meal they ‘created’. Perfect for children aged 24months – 8 years. 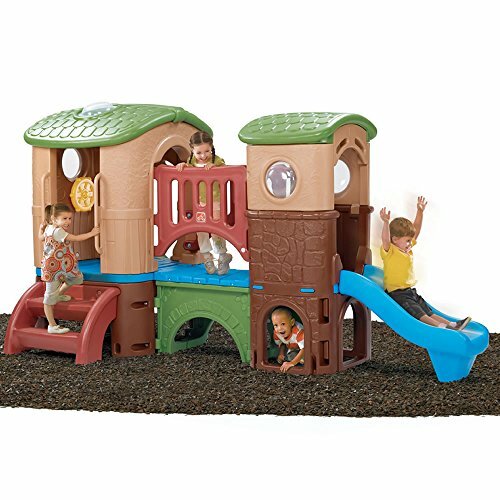 For children aged 36 months – 10 years, this amazing playset will give your children years of fun and entertainment. Comes with two swings and an acrobat swing bar. If you are buying with a toddler in mind, you can add this bucket toddler swing seat as an extra. Has a canopy cover for safe sun play. Comes with a sand play area which is great for toddler sensory activities. Fun slide and climbing wall. Has a built-in fort for hours of imaginative play. Fun snack window and bench seat for rest times. Made from 100% cedar with child and animal safe, chemical-free stain. Looking for more toddler sensory fun? Check out our Ultimate List of Sensory Activities for Kids. Some of the best summer outdoor toys are water toys! Not only do kids get too cool off but they also get soaking wet, which is always lots of fun. 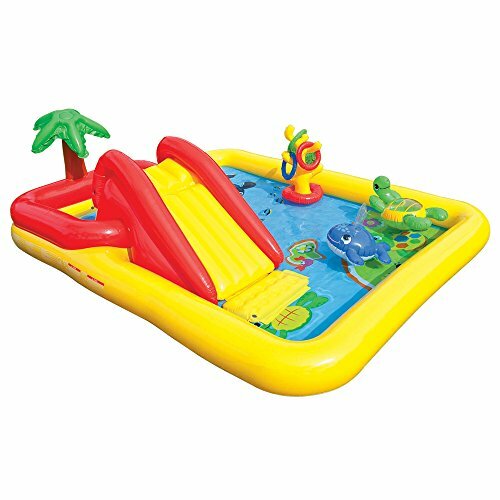 Check out the best backyard water toys below, we really believe they make the best summer toys for toddlers. Includes a shade umbrella for sun protection. Two different level water play areas. This lets children create a fun waterfall. Lots of included water fun activities to develop fine motor skills. This includes a tableside springboard, water spinner and two water squirting figures. Ideal for toddlers aged 18 months all the way to children 8-years-old. Fun sea creatures included encouraging lots of play where toddlers use their imagination. Super easy to set up. 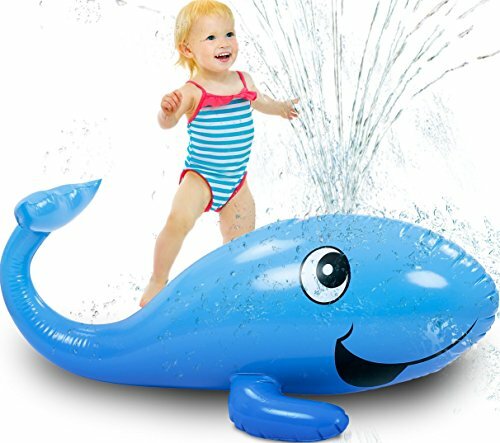 This cute water toy self-inflates once you connect to the garden water hose. Perfect for parents and impatient toddlers. Can be used as a fun garden sprinkler or instead fill it with air and use as a float pool toy. Won’t tip over as is fitted with a stable base when filled with water. An adorable whale design that all kids will love. It’s so fun and bright! We love the cute inflatable palm tree, turtle and whale. Perfect for ages 36 months to 7 years. Includes two pools. 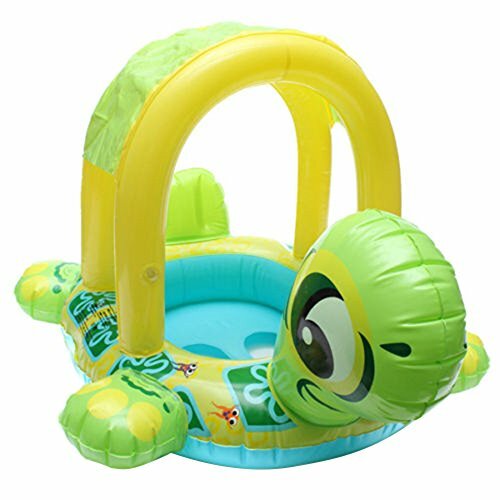 A small one perfect for younger children and a bigger wading pool too. Has a built-in water slide for hours of summer fun. 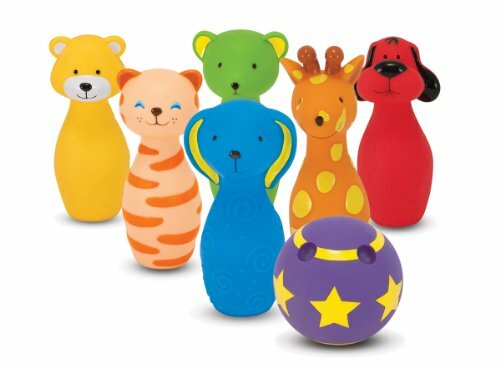 Ring Toss game for developing toddlers gross motor skills. Has a control valve which adjusts water flow, making it perfect for those long summer days. 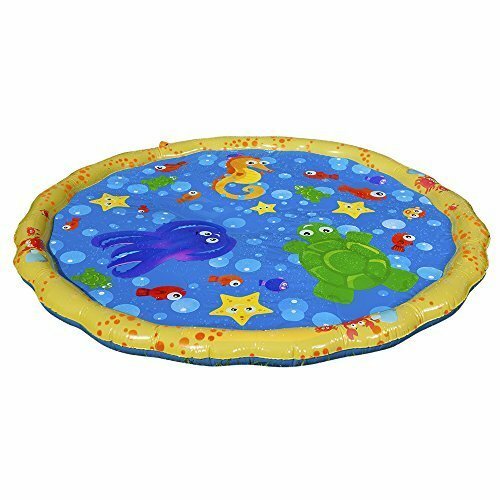 Introduce your toddler to fun water play with this mat recommended for ages 18 months+. Sprays and sprinkles with gentle force. Can attach easily to any garden hose. Easy to set up and pack away. Making it perfect if you are short on outdoor space. Choosing the best garden toys to give as a gift to the toddler in your life can be hard work with so many amazing outdoor toys for kids out there. Luckily for you, we have put together this list of the best outdoor gifts for toddlers. You are sure to find an amazing present to bring lots of outdoor fun and treasured memories for your special little person. Ideal for For 1 to 3 Years Old. Designed to help toddlers learn to balance. Perfect activity to develop gross motor skills. 3 wheel design makes this trike wonderfully stable. 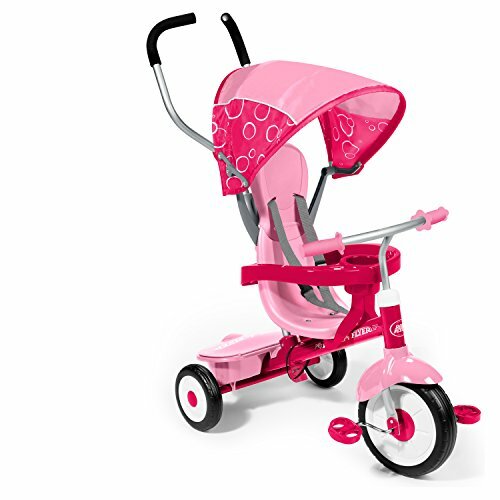 Has enclosed wheel to help prevent any accidents with your toddler’s feet. Leather seat for amazing comfort. 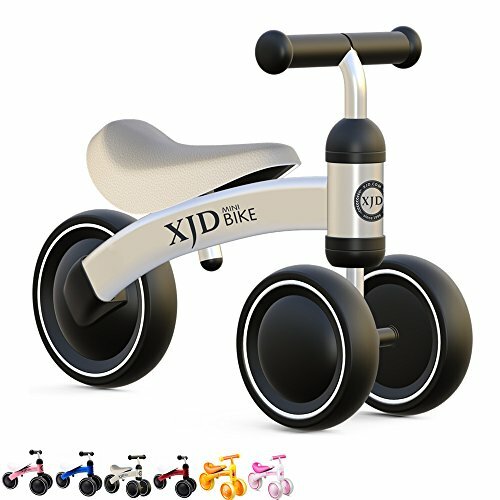 This allows toddlers to play with the trike for hours of outdoor fun. Light materials, allowing your child to move the trike around with ease. Perfect for children over 12 months. Comes with ball pit, long tunnel, play tent and teepee tent. These can be arranged in multiple ways to create hours of fun. 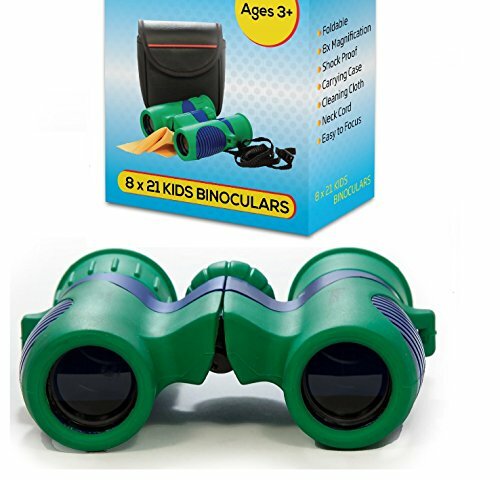 With lots of peep-hole windows, bright colors and imaginative play opportunities, this is one of the best backyard toys to get children enjoying physical play. 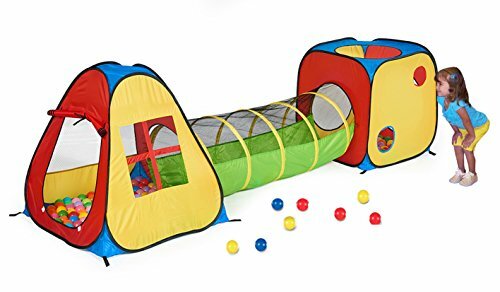 The ball pit is wonderful for developing fine motor skills while crawling through the tunnels will develop a toddler’s gross motor skills too. Parents will also love you as it is made of easy to clean materials, and sets up in seconds. Also comes with a carry bag and can be folded away when not in use. Lots of fun for ages 2 years and up. Includes 6 gorgeous animal character pins and plastic ball. Can be packed away easily and neatly with the included storage case. This outdoor toy has been specially designed to help develop both gross and fine motor skills. Melissa & Doug K’s pride themselves on their Kids toys helping to nurture the three early childhood development key areas of social, cognitive and physical skills. 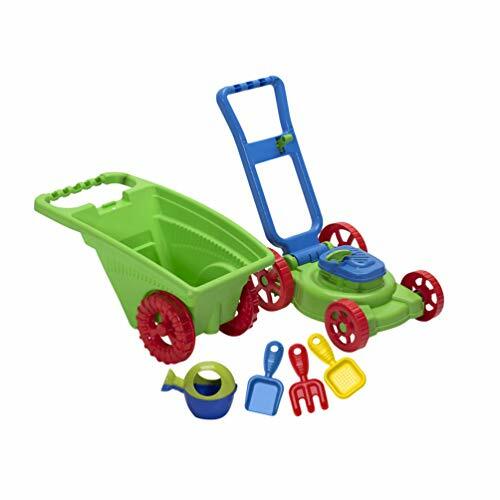 Kids from 2 to 4 years of age will love this fun garden set. Includes lawn mower, watering can, wheelbarrow, pail, shovel and 3 hand tools. Not only is this outdoor toy lots of fun but educational too. Toddlers will love playing grown-ups and learning how to help out with the yard work. Why not use the gardening tools to teach your toddler how to grow their own flowers and vegetables. Such a great way to get children to enjoy being out in nature. 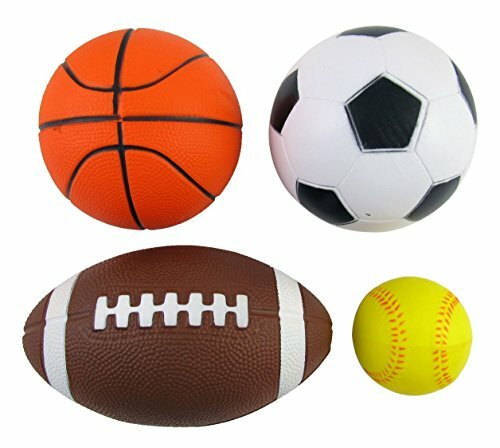 You can’t have a best outdoor toys for preschoolers list without included some fun outdoor sports toys. We show you the best toys for little boys and girls to get them having fun with sports. A great way to teach toddlers all about keeping their bodies moving and healthy. Perfect for children aged 18months to 6 years. Adjustable height for the “T”, perfect for growing with your child and their skills. 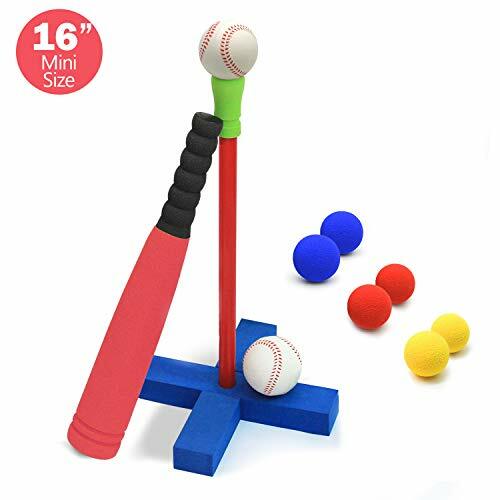 The best toy for developing coordination, gross motor skills and fun batting skills. Can hang on the wall for the perfect storage solution. 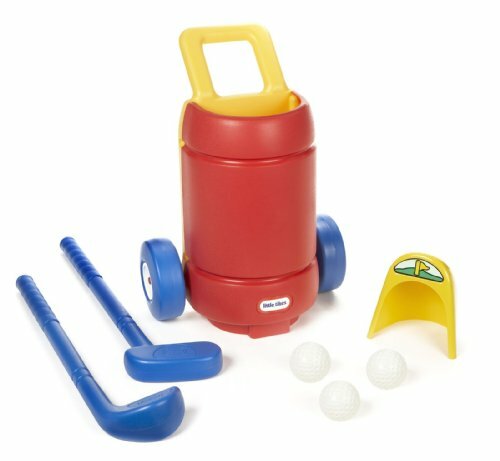 Includes a mini foam soccer ball, basketball, tennis ball and football. A fun way to introduce children to a mix of sports. Easy to take these to the park, beach and even indoors to encourage play and movement. Made with 12months to 6-year-olds in mind. Easy to set up and play put-put golf anywhere outdoors. Includes 2 golf clubs, 3 golf balls and a putting hole. Fun golf cart which your toddler can wheel around. Trying to hit the ball is great for hand-eye coordination. The perfect height and design for children aged 1 1/2 to 5 years. Adjustable height with 6 different settings to pick between 2 and 4 feet. 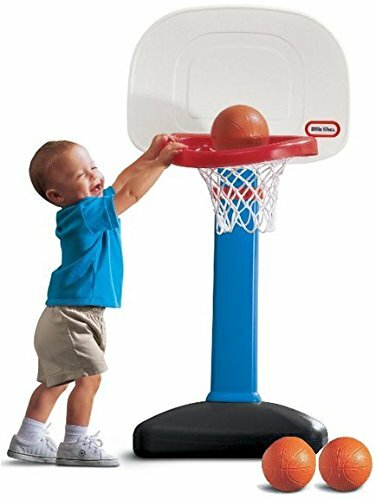 Comes with 3 basketballs in just the right size for your toddler. Designed with an oversized rim to build skill and confidence. Easy to create stability for younger players with the option to fill the base with sand. A wonderful activity to encourage outdoor play and build gross motor skills. Games make the best yard toys for toddlers. They teach sharing, all about playing with others and are great for the whole family to have fun together. They are also some of the best cheap outside toys you can find. This game has two sides meaning double the fun! Includes multiple ways to play, solo, with friends or at parties. Includes a carry handle making it easy to transport and a storage bag for simple tidy up. 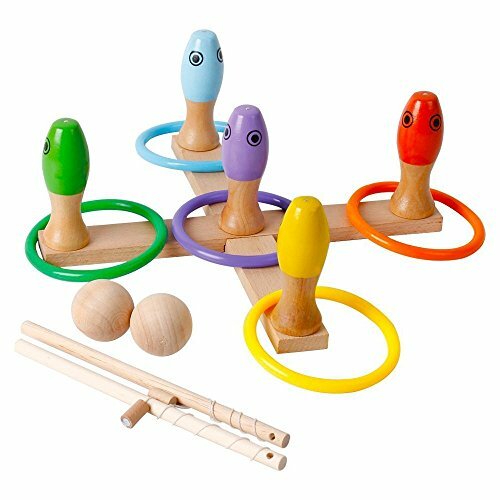 Perfect for helping toddlers develop hand-eye coordination and learn social skills like taking turns. Prints include gorgeous bright animals and numbers for teaching preschoolers counting skills making it perfect them outdoor toys for boys and girls. Includes fun fishing game, ring toss and bowling. Brilliant toddler activities to develop hand-eye coordination. The whole family can have fun playing this yard game together. Easy to take with you to the park, family gatherings and the beach. Creates a fun space for children and promotes imaginative play. 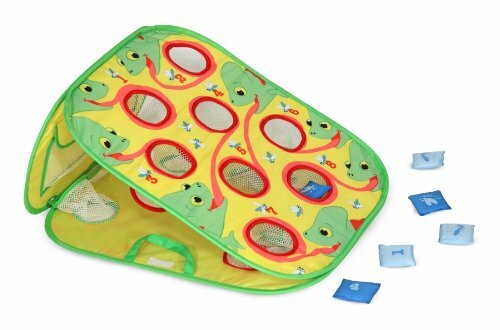 Can be used as a ball pit to develop fine motor skills or put in a blanket and your 1-year-olds favorite toys. Has a fold down door and window. Perfect for every 1-year-olds favorite game, peek-a-boo. Made for 6 to 36-month-old children. Gorgeous and bright designs, they will love. Includes a sunshade to protect delicate skin. Fun way to stay cool this summer and introduce water play. This trike has four stages in one. Perfect to grow with your child. For 9 months old all the way to 5 years. A canopy for sun protection that can be removed when needed. Includes a harness for safety when using for younger children. Can be used as an infant trike, steering trike, learn to rode and finally as a normal trike. Comes with a removable handle for parents to steer the trike with younger children. Has a removable tray, perfect for snacks and a drink when your toddler rides. 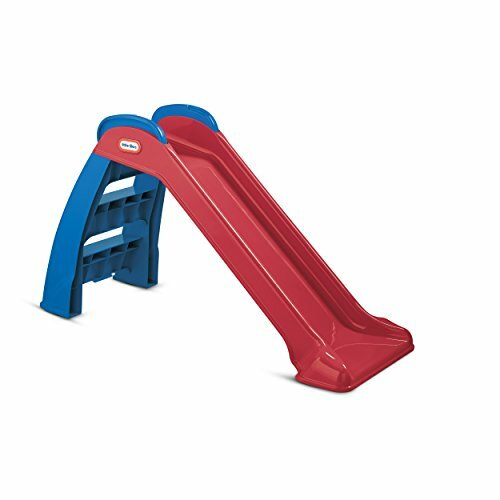 Perfect size for younger children to experience the fun of a slide. Wonderful for teaching confidence and gross motor skills. Made especially for 3 years and up. Easy to focus and use. Develops curiosity and exploration of the great outdoors. Perfect for encouraging child-led learning through researching what your child discovers during thier exploration. Lots of outdoor fun for 3 to 6-year-olds. Easy to assemble and lightweight for easy moving. 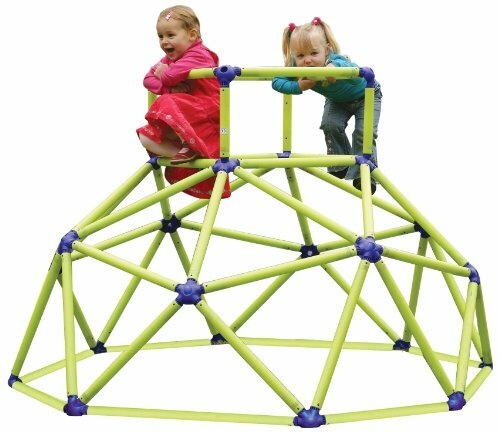 Develop your child’s gross motor skills and confidence with this amazing climbing frame. We hope you loved our list of best outdoor toys for toddlers. Be sure to pin for later and don’t spend hours researching for birthday and Christmas presents for preschoolers.